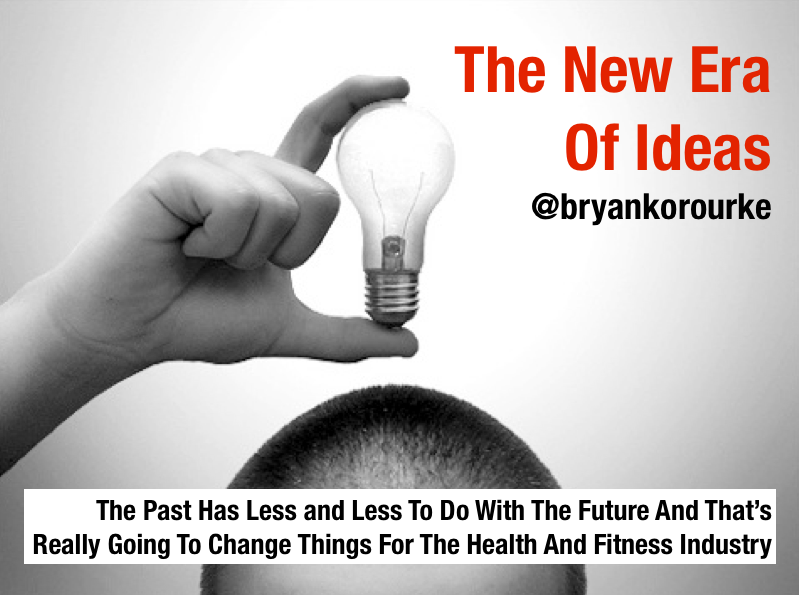 The New Era Of Ideas - Is The Health Club Industry Ready ? That notion was reinforced this Sunday morning, as I paged through the latest content streams for the week ahead, I saw something that reinforced the views of one of my favorite business leaders CK Prahalad and indirectly bolstered my thinking that the new era of ideas is going to take hold very soon in the health club and fitness industry. What did I see ? A new company called Tile ; (video is below), is launching a matchbook sized Bluetooth device that aims to ignite a community movement around keeping track of items in life. They used Crowdfunding with the Selfstarter platform and raised over $1.8 Million . The device is really cool and it was started by two guys. That's it. Something was created that could not have been possible only a few years ago. The idea was funded by thousands of strangers via the Internet. Amazing. Yes, the new era of ideas is here and to the extent two people can figure out how to track stuff in the manner that Tile does, well there are going to be many equally cool ways to do things in the health club and fitness space that no one has consider or was possible just a few years ago. What this means for the health club and fitness industry is that just like Tile, groups of open minded people armed with new business tactics like crowdfunding and an understanding of technology are going to be able to deliver new products and services that are revolutionary. I meet entrepreneurs like them all of the time. They will create entirely new possibilities and usher in a new era for health clubs and fitness . In the era of new ideas, the past means less and less and that means a whole new era of opportunities lies ahead. Who you know and what you did before will not matter in a world of ideas where the freshest and brightest approaches will be able to get to market faster and with less objection than ever before. CK Prahald noted the two key barriers to innovation: not accepting that things have REALLY changed and anchoring yourself in the logic of the past instead of embracing the new. When one sees a solution like Tile, it only goes to prove the point that true innovation in the health club and fitness industry will come from a similar place. Is the industry ready ? I think it is because it doesn't have a choice. Tell me, Bryan O'Rourke, what you think about the new era of ideas. Is the Health Club and Fitness Industry ready for all of this potential ? I'd love to hear your thoughts. Bryan O’Rourke is a health club industry expert, technologist, financier, shareholder and executive in several fitness companies. He works for Fitmarc, which delivers Les Mills programs to over 700 facilities in the US and heads up the firms Integerus and Fitsomo. He advises successful global brands, serves as a member of the GGFA Think Tank and is CEO of the Fitness Industry Technology Council (To join FIT-C visit www.fit-c.org ). Recently Bryan was named to the ACE industry advisory panel. To learn more contact Bryan here today.